1981–1996, and continues as Prof. (ret.) of Astronautics and Space Technology. 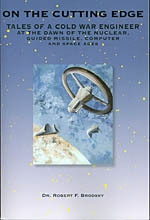 Cutting Edge, appeared in October 2006 (Univ. of Nebraska Press / Amazon.com). environment than Aerojet–General and its newly founded subsidiary, Space–General. Cutting Edge, which covers highlights of his career from the late 1940s to the present. delivery problems of the first DSP sensor systems.